Yet unknown to her, the crippled soldiers could not be saved. Moments after her and her friend depart, the crippled soldiers crosses paths with Makoto, one of the film’s main characters as well as one of the many crows that inhabit The Noisy Requiem. A deranged soul that walks the streets of downtown Osaka, murdering women and bird in the black-lots, salvaging their organs to add to his plastic doll or to him, the love of his life. As he sets eyes to the former soldiers, he berets them; accusing them of being Koreans and never actually participating in the war. As Makoto watches the soldiers slowing lose their tempter, we watch him slowly reach for a claw-hammer concealed behind his pants. What happens next is a brutal scene of violence. These moments aren’t scarce Matsui’s film. It would be an understatement to say Noisy Requiem is not an easy film to sit through, especially considering the duration, and its also one that will surely leave a viewer cold after first viewing. The character of Makoto alone would put off a viewer; his numerous vicious acts makes him one of most perverse and psychotic characters ever captured on celluloid. But Makoto is only one of the many crows that populate the dark belly of Osaka. Matsui also introduces us to incestuous siblings, unhappy dwarf orphans running a small business, and a unintelligible vagrant who wonders the streets with a stump that resembles something rather suggestive. While we watch each of these characters engage in questionable, and in some cases unbearable, acts, we are reminded that these were once white pigeons that hungered for grain that was out of reach. Requiem is less a narrative, and more a portrait of these characters. Makato engages in ruthless acts of violence but also is shown making love to his mannequin; the dwarf woman is shown humiliated almost everywhere she goes, bottling in her anger; the incestuous couple walk the streets together, sometimes stopping to play hopscotch and so on. Yet Matsui never portrays these characters with a sense of ironic humor or even as disgusting creatures; Most of them are presented as sympathetic. Maybe its because Matsui, as well as we, know that these characters have little chance for assimilation with society and their fate is all but sealed. His freaks are as tragic as those of Brownings’, yet shown under the affectionate light that Waters often reserved for his social misfits as they took pleasure in trumping each other in crude behavior. Matsui’s film is one about the socially neglected; Each character pushed so far from society to the point of criminal and perverse activity. Some have already reached their extreme (Makato) while others (the incestuous couple and dwarfs) we watch slowly transform into what society expects from them. But to Matsui, these are are just wounded souls in search for love and acceptance. In the film’s finest moments, we watch these characters try to achieve this. In a beautiful sequence, we see the murderous Makato dancing with his lover/mannequin. Its here we see the last bit of humanity left in him and in a way it’s oddly touching. In an interview for Midnight Eye, Matsui explained how he saw a type of beauty and purity in some of his character’s perverse acts because they came from a longing that society doesn’t understand nor would ever come to accept. And while it may seem morbid, a viewer can see that. The idea can be viewed as a grim allegory for any individual who feels alienated from society. Having worked on the film for five years, Noisy Requiem is nothing if not Yoshihiko Matsui’s magnum opus. Having worked with major names like the late avant-garde filmmaker Shuji Terayama and influential punk filmmaker Sogo Ishii, Matsui was no stranger to the Japanese Underground Cinema. But nothing could have ever prepared anyone for something like Noisy Requiem. Equivalent to something like David Lynch’s Eraserhead or Alejandro Jodorowsky’s El Topo, Requiem is a work both controversial and infamous in Japan. Sadly the work remains rather obscure to the west. This film could have been a two and a half hour freak show or a cheap exploitation film; but in Matsui’s hands, we are given a savage and thought provoking work of art. 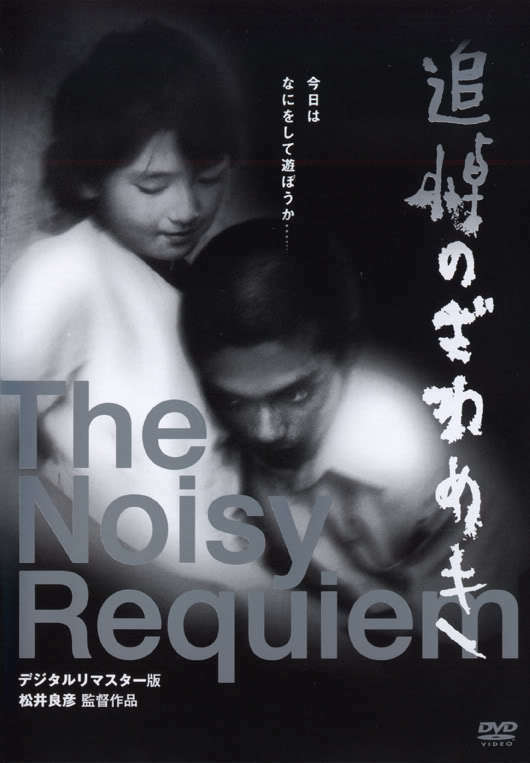 This entry was posted in Essays, Film, Filmmaking, Reviews and tagged Film, Film as a Subversive Art, Japanese Cinema, reviews, The Noisy Requiem, Yoshihiko Matsui. Bookmark the permalink.